Supplements- What’s So Good About Magnesium? If you’ve been a regular at our place for a while you will no doubt have heard us talk about the benefits of Magnesium. Magnesium is responsible for around 300 different processes in the body, making it a very important mineral. Cardiovascular health (reducing blood pressure), increasing insulin sensitivity (a potential use for Type 2 Diabetics), relaxing and calming effects (helps you to sleep better) and prevention of cramps. I have personally found that after taking my magnesium in the evenings I get a much better quality sleep than when I don’t, and I’m sure many of my patients will agree too. Do You Need Magnesium Or Can You Get It From Your Diet? In theory you should be able to get sufficient levels of magnesium in your body through good diet alone and not need a supplement. However most western diets (and most of my patients) don’t eat enough dark green leafy vegetables to get sufficient quantities. Whether you need to be taking magnesium or not depends on a person to person basis. You can get blood tests done to check your levels but these will often need to be paid for. We can often determine the likelihood of you needing magnesium through a consultation and the signs and symptoms you present with. Generally speaking most people will benefit from taking a supplement in my experience. What Forms Do Magnesium Come In? Magnesium supplements come in different forms such as Magnesium Glycinate, Citrate and Oxide, and some forms are better than others for different reasons. 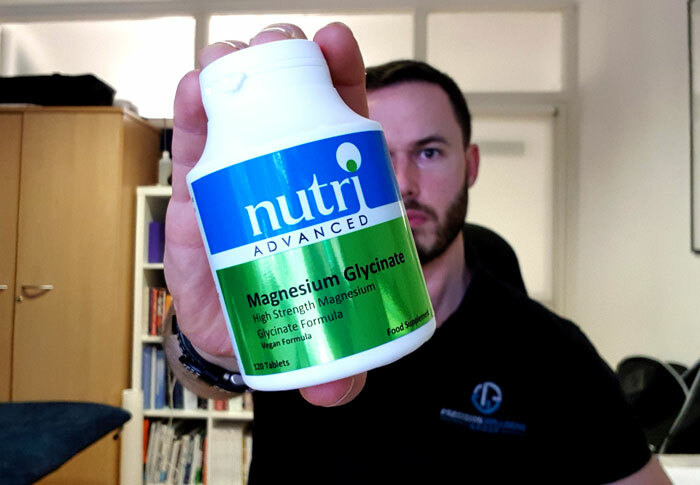 In general Magnesium is actually one of the few supplements that you will notice a real difference from taking especially if you have tight muscles, frequently get muscle cramps, suffer from constipation or have trouble with sleep. Most of my patients who have come in for muscular or skeletal problems will come back after taking the glycinate form and often ask for more. I recommend Magnesium Glycinate the most for muscular issues because it is the best absorbed into the muscles. However for those with constipation issues I recommend Magnesium Citrate. Lastly I also highly recommend you buy a good quality brand (they are often worth paying more for) because they will generally be better quality, have more of the available ingredient and will provide a better result. If you have what benefits have you noticed?